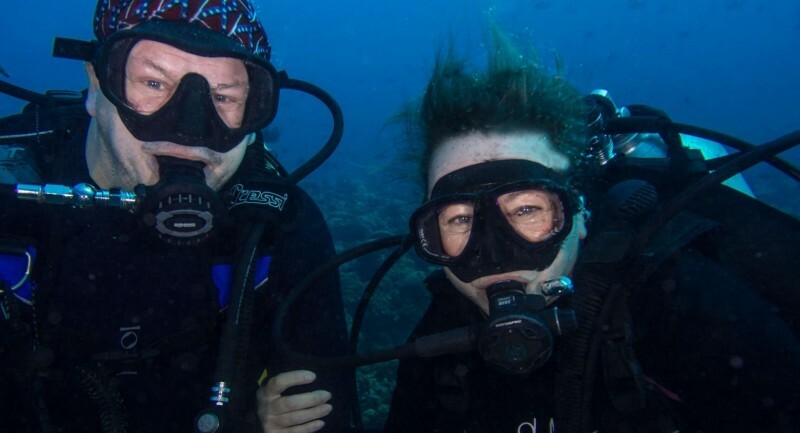 We’ve seen some amazing sights underwater over the years, and shared some really special moments, but very few come close to the moment you see two of your friends get engaged during a dive! This is exactly what happened during our week diving from the Blue Voyager in the Maldives. Our friend Simon Plank gave us the heads up of his plans before we left the UK hoping that we would capture the moment he proposed to his long term girlfriend Marnie Starr. A discussion with the Cruise Director at the start of the trip gave Simon the very viable option of a perfect dive site midweek, famous for a Manta cleaning station. It’s fair to say that the nerves were getting the better of Simon just before the dive – so much so he forgot to write the proposal message on the dive slate as he entered the water. Fortunately we were on hand to help out, and after slipping Simon the slate during the dive and distracting Marnie for him to get prepared, the moment happened. I think it’s fair to say that Marnie was completely shocked! The whole world stood still for a moment as she processed what was happening… Finally she accepted, and they sealed the occasion with an underwater kiss. There’s a great moment in the video when an over-zealous diver who is completely oblivious to what was happening was trying hard to point out a beautiful turtle cruising through the group – and yes, the Manta’s did arrive and gave us one hell of a show to mark the occasion! A perfect moment, on a perfect dive, on a perfect trip!